Last Wednesday, I travelled north through the miles of highly populated highways along the Hudson River’s New York and New Jersey divide to attend the opening of the 24th Annual NJ Small Works Show at Mikhail Zakin Gallery in Demarest, New Jersey. Juror Rachael Faillace, the Executive Director of the Rahway Arts Guild Inc. and former Director of the Mikhail Zakin Gallery, selected a substantial array of artwork that did not exclude any one type of media. The only limitation: each work may not exceed 18″ in any direction, so mixed media work hung side-by-side with photography, encaustic painting, fiber art, ceramic sculpture, functional clay, one-of-a-kind jewelry, printmaking and collage. My jewelry piece, Widget Locket #4: Homage to Mexico debuted in this exhibit. As discussed in a prior post, my locket uses motifs derived from the history of Mexico’s decorative arts with text snippets taken from the headlines one reads on scrolling computer widgets and smart phones. 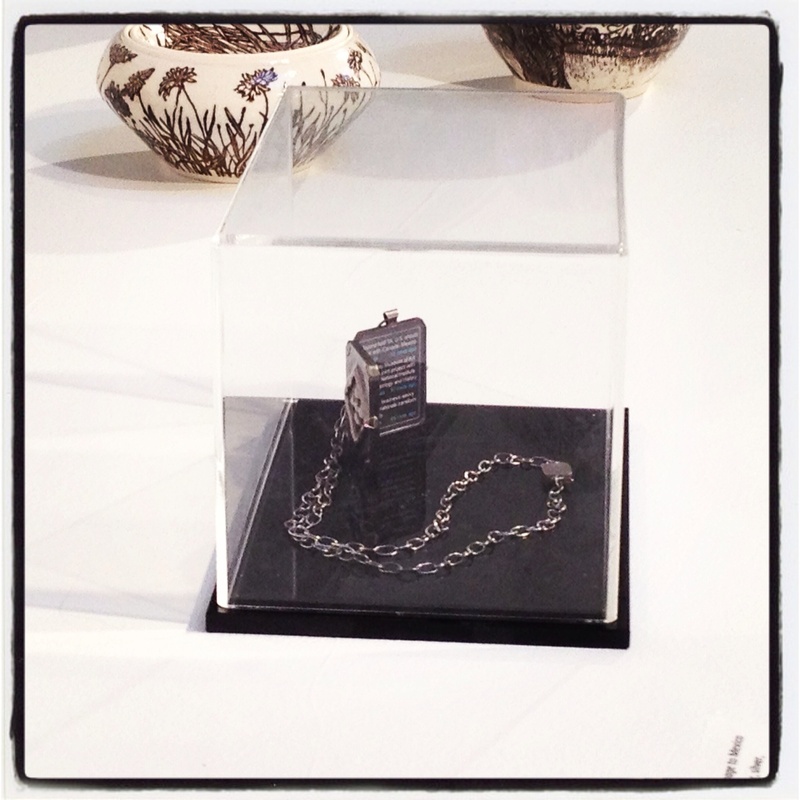 Using this Widget Locket as an example, Gallery Director John J. McGurk set up/installed this show in such a highly professional manner with such refined sensibilities as one can readily see in his meticulous approach to the display of both fine craft and painterly/2-D media. Patricia Malarcher’s Cloud is a gorgeous fiber piece that uses encaustic to enhance and create waves of unequal origin around a center matrix of sewn fabric. The entire piece’s monochromatic tonality makes one feel as though he/she is looking at a sort of celestial “cloud” or falling star. 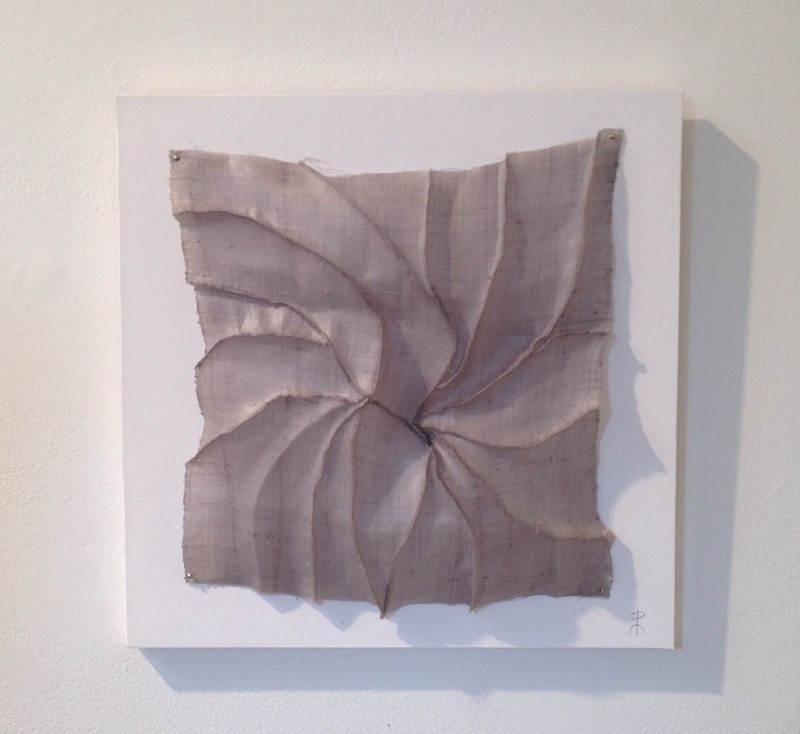 The ridges that Malarcher draws with her needle and thread create a pinwheel effect that one can imagine if this object were to be floating through a sky, it would be a surviving entity due to its strong interior core of wax over fiber. Incidentally, Malarcher was the editor for nearly twenty years of the prestigious and widely-regarded Surface Design Journal. This publication of the Surface Design Association features articles that focus on contemporary textile and fiber-based art forms. Hilary Shank-Kuhl, “Passing Storm”. (NY Times Metro section, July 2013.) Encaustic painting, 2013. Painter Hilary Shank-Kuhl’s encaustic painting Passing Storm is a haunting landscape of magnificent depth despite its small-scale canvas. This work was chosen by The New York Times’ Metro section as the pictorial announcement to this NJ Small Works exhibit. 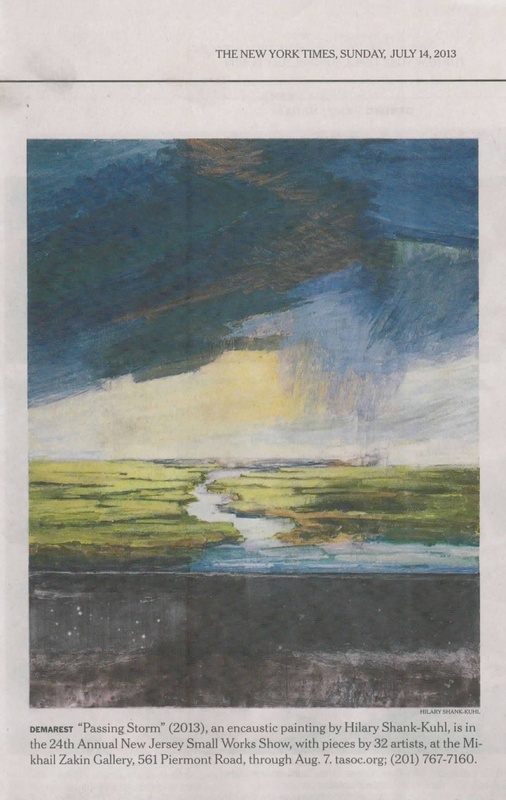 Kuhl has a masterful sense of hatching lines as she draws vividly through the wax pigments and creates a true path of movement along the waterway that allows one to believe he/she is about to move through that meandering water in the painting’s center and end up at the horizon of ominous clouds. 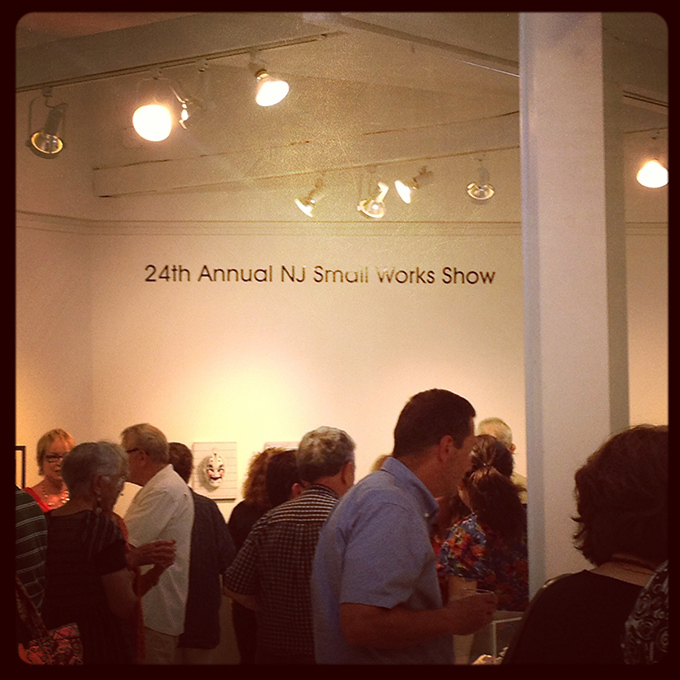 The 24th Annual NJ Small Works Juried Show features work by 32 artists exhibiting this month at Mikhail Zakin Gallery, July 19th through August 7th, 2013, located at 561 Piermont Road in Demarest, New Jersey, approximately 20 minutes from midtown Manhattan. Except where noted, images appear courtesy of the artists. Claudia, I was so incredibly pleased with how this gallery displayed my locket. While conceptually the inside text is what is most important, too often galleries fall short and decide to “hang” my work by the chain, completely obstructing the chasing and repousse work found on the cover. And yes – lockets DO generally only have someone’s picture inside, but not my current body of work! More to come….and thanks so much for stopping by to comment! VERY interesting point you’ve brought up, Anita. Generally, I’m finding in group shows like this with 30 or more artists, you rarely have any input in how your work is displayed. I do usually include a printed doc w/my work that gives display instructions, but depending upon the gallery, it’s not always followed. However in this case, the gallery did a magnificent job w/ hanging and setting up the show. I do think that available gallery wall and floor space is usually why. Thanks so much for your spirited and flattering comments, Anita!! Dawn, I knew you would understand this display issue, esp. w/your upcoming exhibits. I often wonder in a juried group show setting (not a solo show where the artist usually hangs/sets up their entire work themselves) how appropriate is it to ask for a pedestal vs. wall display or a plexi hood, etc? Thanks for your positive feedback re: the look of the work at this show; the gallery folks here are really on the ball! You just made my day, Sharon. I’m so glad you enjoyed hearing about Patricia Malarcher’s fiber piece – it was one of my absolute favs from the exhibit! I can’t agree more w/ you saying the Internet has created whole new audiences for our work. So fantastic that you stopped in to comment – thank you! Thank you, Patricia, for giving us a taste of this exhibition. I’ve very much enjoyed the small sampling you’ve shown us. 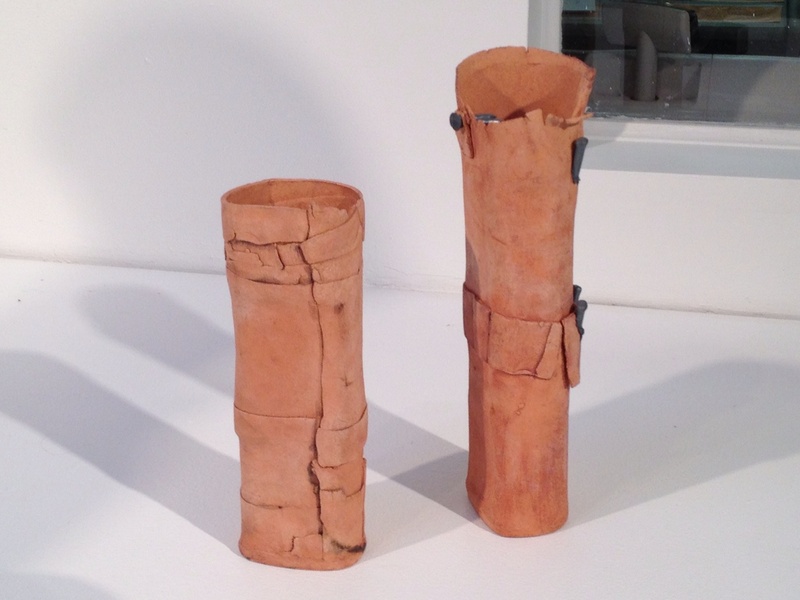 The clay pieces, which I found a bit unsettling at first, finally “grabbed” me and won me over. The scale, the texture, the metal clips, it’s just so “human” and endearing. And congratulations again on having your locket included! It’s good to see it in a gallery in the company of other very fine pieces. With an audience, and in this context, it resonates even more. Dominique, your comments are always so inspiring and add a new heightened level to each artwork I choose to discuss. I agree w/your perceptive “take” on Risa Hirsch Ehrlich’s piece. The way the clay folds over and exposes such stark lines could be seen as unsettling but truth is, it actually shows a more fragile side just as you’ve stated. TY – always a pleasure to have you stop by! Great post, Patricia! I especially liked the image of opening night; it gives one a sense of the ambiance that must have pervaded the gallery that evening. Also, how cool to see not only your work, but some of the other highlights of the show. Again, congratulations! Exciting stuff. Thanks so much, Gina Marie – it was in fact a great night and my husband and I continued the celebrating at a fantastic local Japanese restaurant after the opening! It was an uplifting experience to show my jewelry amongst such lovely work from other artists as well. Thanks again for your fabulous comments! !